I am so excited to share with you the FUN event that I signed up for today. SPARK! It is Nov 6-7th. I am really looking forward to visiting Salt Lake City, I've never been. The event looks like it'll be a great mix of activities, from photography, mixed media journal/book class, a jewelry class, and a fabric sewing class!! There will be goodies both days and the following speaker that I copied over from the SPARK website! 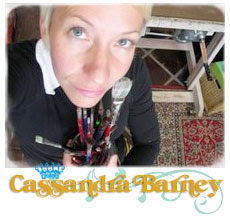 Cassandra Barney. a woman artist who speaks to our creative souls! We are sure she will Spark our creative spirits! Let me know if anyone else wants to go!! I know that it is just the weekend before Silver Bella, but hey, there is nothing that says more creativity is a bad thing!! I so wanted to go to this but unfortunately one of my husband's good friends is getting married in Illinois the same weekend. Have fun and I can't wait to hear how it goes!! Can't wait to meet you at Spark! It sounds super fun! !